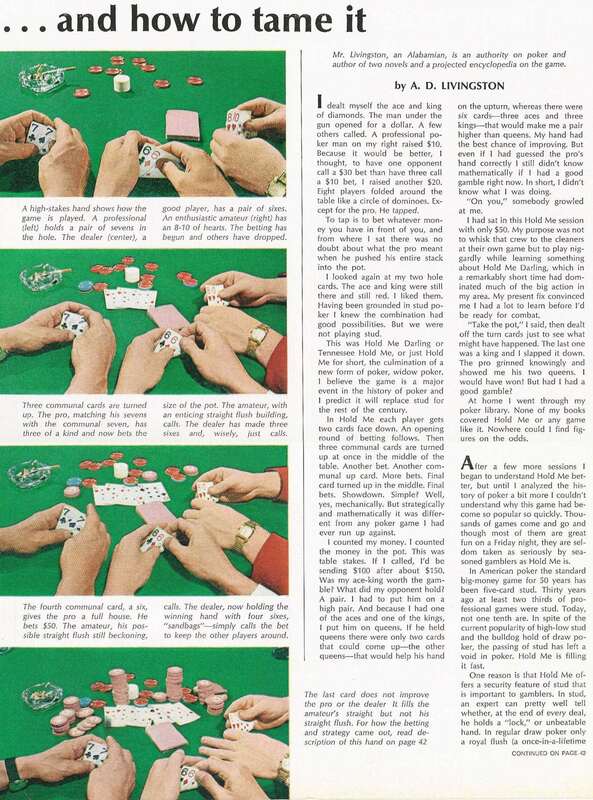 The photos below are of what appears to be the first nationally published description of Texas Hold 'Em, also known in this article as Tennessee Hold Me and Hold Me Darling. 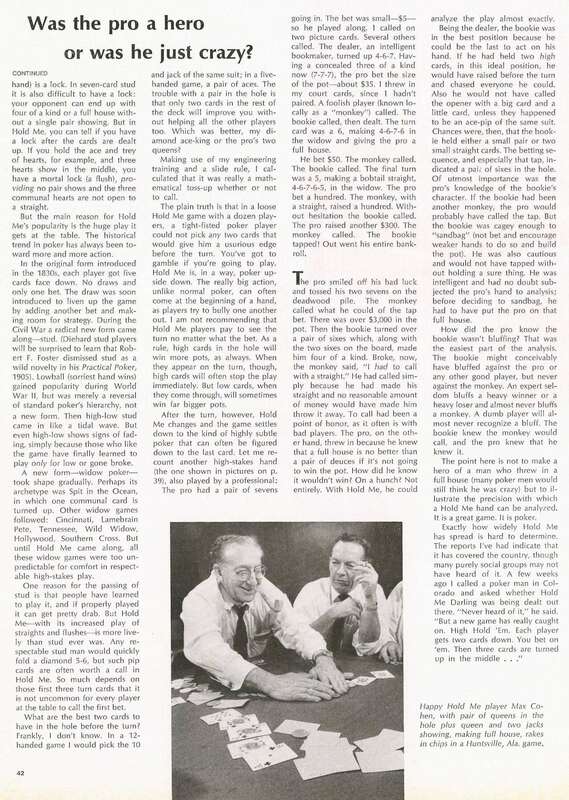 This article, written by A D Livingston, appears in a national magazine in the late 60's, and it is believed to be the first printed description of the game of Holdem' Poker. Here are a few interesting quotes from the article. (1) This is poker? 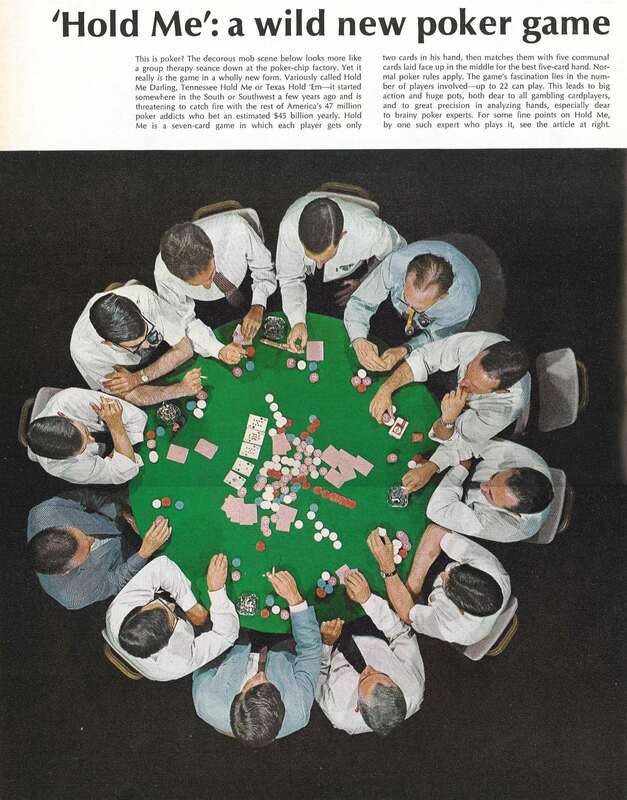 The decorous mob scene below looks more like a group therapy séance down at the poker-chip factory. (2) The game's fascination lies in the number of players involved -- up to 22 can play. (3) This was Hold me Darling or Tennessee Hold Me, or just Hold Me for short, the culmination of a new form of poker, widow poker. (4) I believe the game is a major event in the history of poker and I predict it will replace stud for the rest of the century. (5) At home, I went through my poker library. None of my books covered Hold me or any game like it. (6) Hold Me is, in a way, poker upside down. The really big action, unlike normal poker, can often come at the beginning of a hand, as players try to bully one another out. (7) A few weeks ago, I called a poker man in Colorado and asked whether Hold Me Darling was being dealt out there. "Never heard of it", he said, "but a new game has really caught on. High Hold 'em. Each player gets two cards..."
On an interesting note, the author, A D Livingston, does not mention the name "Texas Hold 'Em." However, apparently, the editor appears to have made an introductory note including "Texas Hold 'Em" as one of possible names in his preface to the article. Also, the preface makes mention of "America's 47 million poker addicts who bet an estimated $45 billion per year."